US, 1990, 100 minutes, Colour. Patty Duke, Richard Masur, Stephen Dorf, David Birney, Joan Van Ark, Sam Wanamaker. 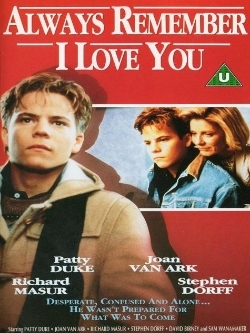 Always Remember I Love You is a very moving telemovie about a baby who was stolen from its family, adopted by an affluent couple, and the boy discovering that he was adopted when he turned 16 - and who then goes to seek out his natural family. The film shows the issues of the anguished adoptive parents, the confusion of the 16-year-old boy, his hankering to find his identity, the very sympathetic Ohio natural family - both parents and children - and the final questions that the boy must ask himself about where he belongs. The boy is particularly well played by Stephen Dorf, who had appeared in the thriller The Gate, but who was to come to international success with such films as The Power of One, Backbeat, Judgment Night, SFW. Patty Duke and Richard Masur are very sympathetic as the natural parents. David Birney and Joan van Ark are less sympathetic as the adoptive parents - which complicates the drama and the boy's decisions. The film creates its characters well, highlights the horror of the crime of baby snatching and its consequences. It is an emotional experience for the wide television audience. 1. The impact of the film? Human drama? Suffering, love, decisions? 2. The affluent world of Robert, parties, school, apartments, legal offices? The contrast with the Ohio town, the ordinary home, the garage? The musical score? 3. The title, Robert's dilemma, his final decision - and the letter that he wrote to Ruth? 4. The credibility of the basic situation: the flashbacks indicating the baby stealing? The ordinary family, the missing baby, the newspaper write-ups? The criminals, the affluent legal broker in the city? The selling of the babies to parents who did not know that they were stolen? The later consequences? 5. The lawyer friend, the death of the criminal, his fear of discovery, telling the truth to the parents? Robert overhearing, confronting him in his office, finding the files? 6. Robert, 16, his relationship with his parents, close and distant, especially his father? The birthday party, society? Hope for the car, the gift of the watch? His love for his grandfather and talking with him? The discovery of the truth, his anger and confusion? Decision to leave home? Camping, the tent, finding his family - after looking through the files? Going to the shop, meeting Ruth, testing the glasses frames? Meeting her in the diner? Finding John, joining in the games? His talking about visiting family, John inviting him home? His moving in? The friendship with John, asking about what it was like to have a sister? His relationship with Ruth and Earl? His becoming part of the family? His being in the backyard and remembering his being stolen (and the memories from his dreams)? The clashes with John, getting John home, John's resentment of the favoritism? The Christmas celebrations, the meals, the gifts? His not wanting contact with his parents? His mother's phone call, going to see his parents, arguing, not knowing what he would do? The changing attitudes, realising he did not fit in, taking attention away from John? His decision to leave? Return to his parents? The heartfelt letter to Ruth - and telling her the truth? "And always remember I love you"? 7. Robert's parents, affluent, successful, the adoption, not knowing the truth, not telling Robert? The party, the gift? His grandfather? The argument and the truth? Their being hurt? The confrontation with the crooked lawyer? Martha and her going in search of Robert, her husband not wishing her to? Traveling Ohio, discovering him? Meeting Ruth? The discussions? Pleading with Robert, his coming back to them and their joy? Facing the reality of the love for the natural parents? 8. Ruth and Earl, their life, the grief of the stolen baby - and the articles which Robert found in the files? Their work, family? John - with his friends, playing with Robert, enjoying his company, big brother? Then reacting, resentful? Feeling that Robert was favourite? Sally as the little sister? The life of the family and its attraction for Robert? Ruth and her concern, the clash with Earl and not telling him the truth about Robert's mother coming? The reconciliation? The dramatic impact of Ruth finding Robert's letter and reading it? Being reassured about what had happened to her son? 9. Themes of family, love, justice? Adopted children and their need to know their natural family? The quest for identity? Not being able to re-create the past? Not being able to come into people's settled lives, realising the consequences and accepting them?